My inspiration for our property (*until they started claiming rights to the term "urban homestead" and giving off a bit of a cult-ey vibe*) were the Dervais family in southern California. They produce tons and tons of food on just 1/10 of an acre. They're the go-to model for a lot of people of what is possible in a small space. We have quite a bit more space than that, though we're definitely a smallholding or homestead rather than a fully-fledged farm. Particularly because we have a lot less labour, our plans need to unfold gradually. Planning our property out has been interesting, because I want so much for the entire acre to have maximum productivity. What does maximum productivity mean, and how quickly does one get to this mythical status? Maximum productivity is of course really subjective, and if you’re starting out I’m still thinking through if this is a helpful goal. 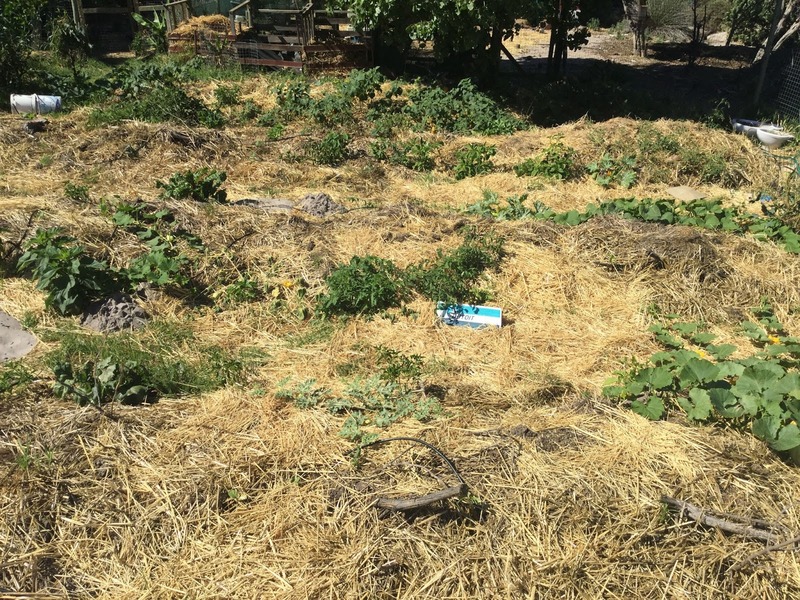 If you’re like me, you’re not quite doing a really perfectly planned permaculture design. You’re probably not doing a permablitz where a lot of people come over and transform everything in a weekend (though hey, if you guys want to come over work on a section of our property, I'm in! I'll plan it and do the free lunch and everything). I’m into design, but it’s hard to get to design quickly or all at once. Good design dawns slowly, and changes in stages as we go. At the same time, sun and water are so important so we also don’t want to prevent future productivity by planting a huge tree or building a structure where we could actually grow good food in the future. Animals are another really challenging factor on the urban edge: where do you put walls, where do you put animals? How do you make sure you don't negatively affect neighbours? In planning, you almost have to know what you don’t yet know. So it’s ok to make mistakes and also to have a plan that changes. 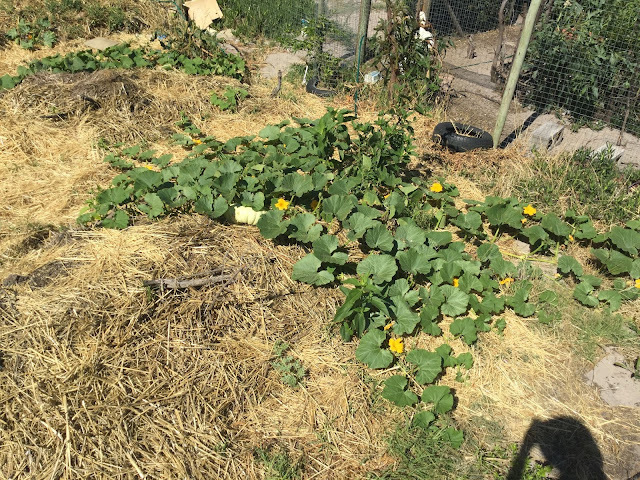 It took almost two years to plan and bring in enough sticks and manure to make it work, but our vegetable garden this year is doing pretty well, and has had nothing but stored rainwater so far this drought year. We’re eating about 2kg of tomatoes every day (fresh and in sauce) for now, as well as a couple of beetroots whenever we want them (four or five a week), spinach, cape gooseberries (10-20 or so every day), we have many pumpkins and butternut maturing well on their vines (and getting eaten by molerats, unfortunately), various peppers almost ready to pick, as well as some just starting out, sweet potatoes are getting going, and I could imagine setting up a few more beds so that in a couple of years we can grow a lot more. The plan for the hugelbeds took quite a bit of time, and unfolded over time— though we did plan around sun and reservoir (rain) water. A lot of food in 4 hugelbeds. 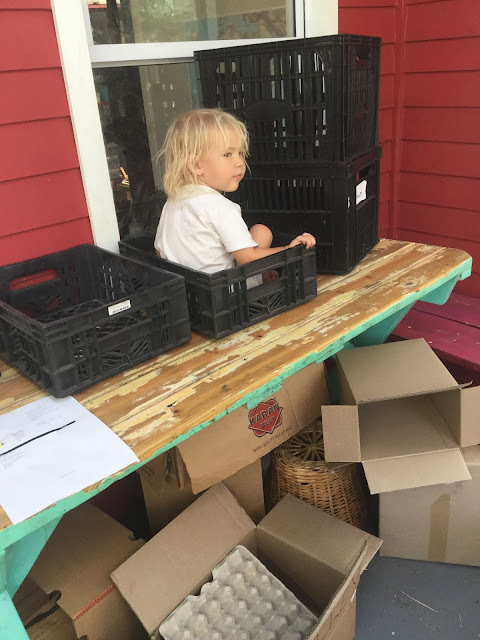 We're wanting to use as little as possible of our property for driveways and cars, and so, having moved our car back for now (and hoping to move it back still further), we have a small space between our container and our house— about the size of a carport. Though we’ve long put straw down, the straw just blows away, leaving eroding sand blowing away next to our house. Added to this, we have a sneaking suspicion that the foundation of our house is not well built (we used an existing foundation on the property, and it’s just rocks and concrete built up together). The blowing sand from under the foundation was a concern for us and January and February always bring serious winds. So I found a (free to us) source of landscaping rocks, and have been putting rocks between the house and the container, to help stabilize our foundation and stop erosion. What’s interesting is that in stabilizing this small area around our house, we seem to be facilitating the growth of other things around it. 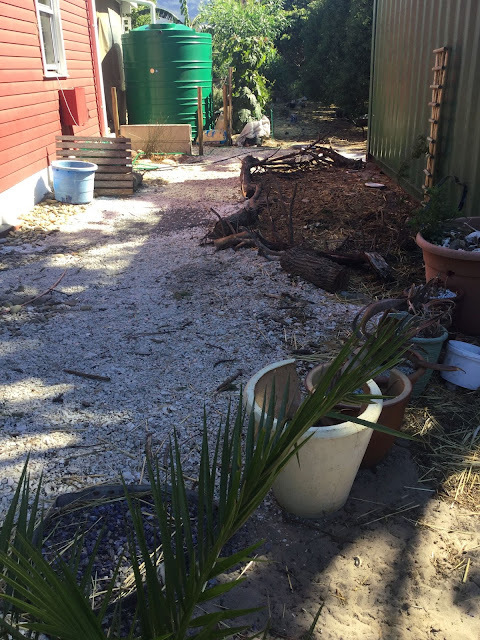 I was a little worried about putting down landscaping rocks and non-edibles (bromeliads and a tree fern, as well as some succulents): it seemed like a concession of precious space that could be used for edibles and defeat the purpose of not using the space for a carport. Yet it’s been interesting to see how adding plants (though non-edible) and rocks to this eroded section of our property seems to have a potential ripple effect— perhaps we’ll be able to add edibles or more useful flowers over time, or perhaps we’ll accept that ecological diversity—no matter what the shape— adds something. Over time I'm tending towards doing things project by project, based on what presents itself as a priority, is a good way to go when one cannot overhaul an acre all at once. Over time, these projects compound, and you start to build momentum, feel encouraged, and see more fruit (and vegetables). So far, my experience is that it's important to be somewhat aware of sun (including variations in temperature, or microclimates— though this can be a little complicated to actually figure out in the beginning), water, and wind. Beyond this, I think it's important not to worry if bits don't work and you have to reconsider (replant) and let things evolve. 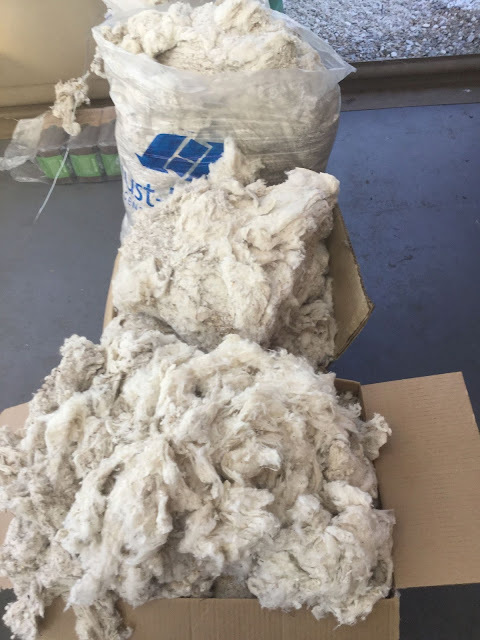 This would probably best serve as a blog post once I've actually made something, but here's 54kg of dirty raw wool, which has been sitting outside for a long time before i got it so has twigs and leaves got pretty far into the bale. Our first step has been to untie the bale and sort through the wool, finding parts that had foreign objects (difficult to get out, even with washing) and sections that were relatively clean. Of course, I chose to do this on our Good Food Club Market Day, where we're also dealing with 20 families' food for the month. It made a weird kind of sense because it's a day when none of us can do much else, anyway. I used some of the dirtiest wool as mulch around a few trees. 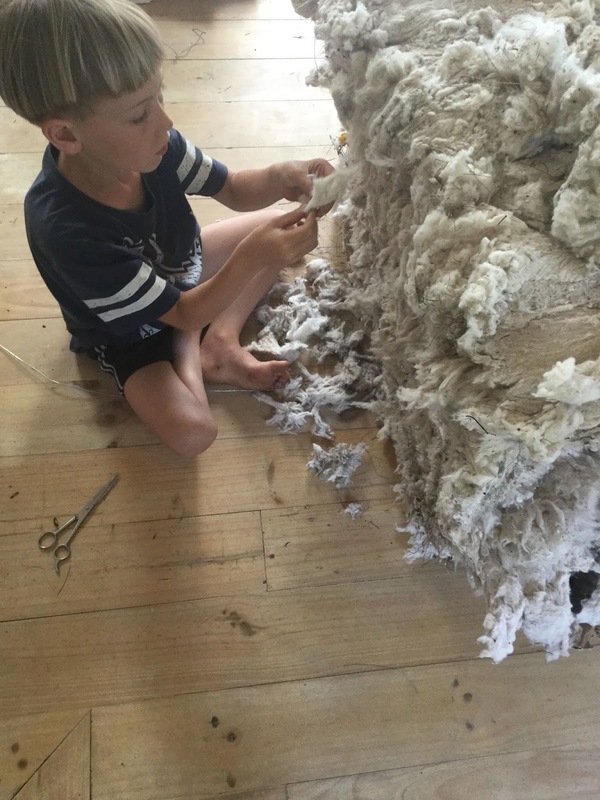 I am planning on trying to make a mattress topper with some of the other dirty wool, and on spending time with the kids (and maybe also Elona) dying and felting balls of wool for a carpet. The kids really enjoy working with the wool, provided I don't micromanage too much. 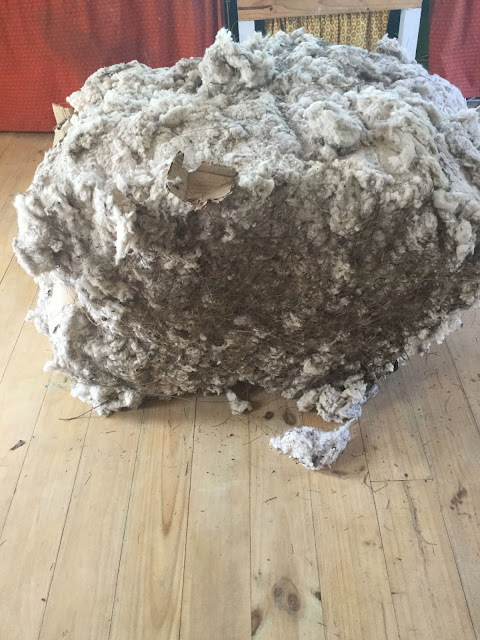 When we took off the wire, the wool basically expanded to fill our entire house. 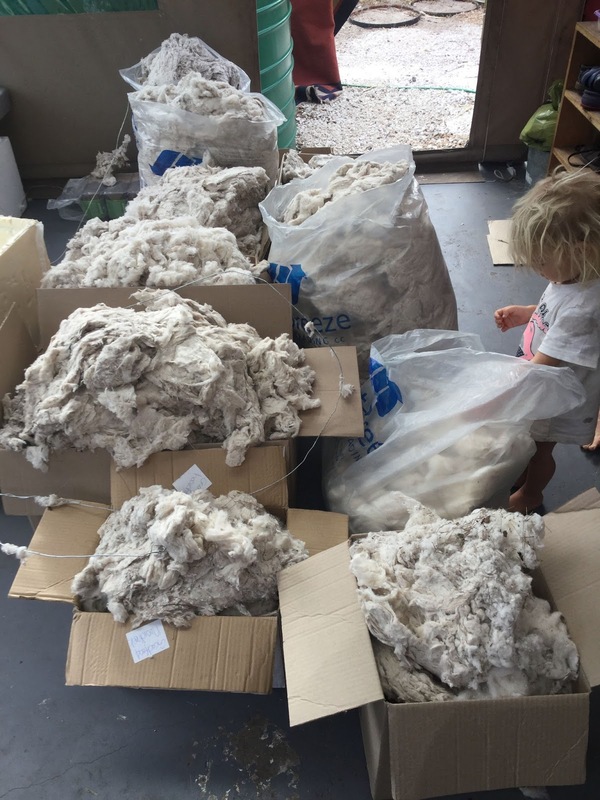 I had to rapidly send a lot of it into the container without sorting, so that Noah's lungs weren't completely blocked up with wool dust. Hana is unpacking the only bag of really nice wool. It's a strange experiment, but I've wanted to make some (larger) version of this carpet for years. As a child, the only reason I tolerated holiday hiking was for the chocolate that we got at the top. Sometimes even that was a bit of a disappointment (intrinsic rewards and all that). My mom never came along, and I suspected she had the better deal. 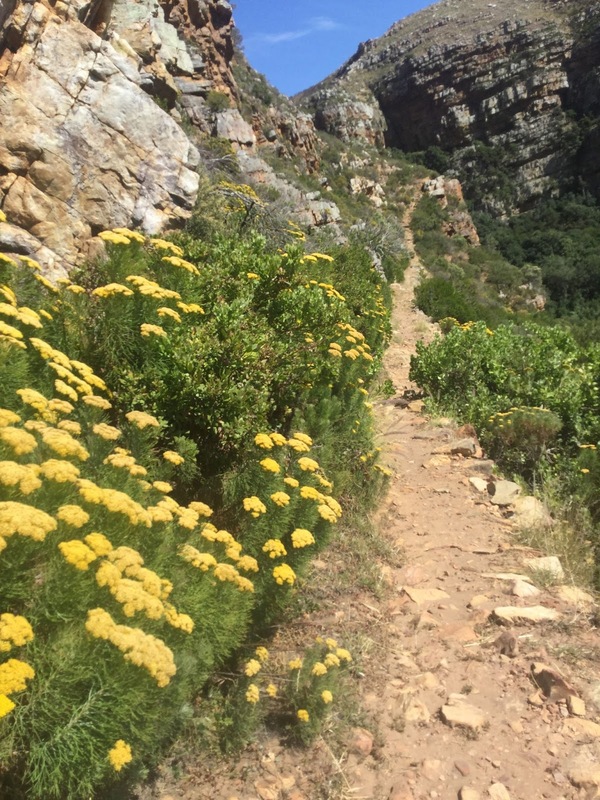 These days, those feelings about hiking are compounded by a two-year old who likes to be held, and a five year old who hikes barefoot (yes, I've calculated how long we'd have if he got bitten by a Puff Adder), a seven year old who is a mountain goat, and a husband who has very similar feelings on hiking, and usually stays home and works when we go on adventures. Still, WE LIVE NEXT TO BEAUTIFUL MOUNTAINS!!! THESE MOUNTAINS ARE NEXT TO AMAZING OCEANS!! 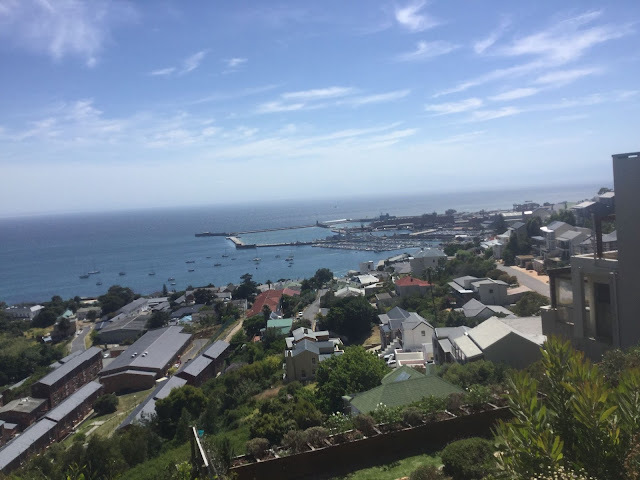 And there was this one magical (though super windy) walk this past April, with Eug's family visiting Cape Town, where one dear cousin would carry Eli any time he needed a ride. This gave me a hint of the beautiful possibility of hiking together. Anyway, with that long preamble, I'm always looking for walks fulfilling the following criteria: short drives, short walks, and body of water to swim in. These are very important because I can't usually plan enough to have elaborate snacks, so the reward is always swimming in the water. The snack is always apples. Anyway, I'm lucky enough that there are a few options that actually fulfill all three stringent criteria. 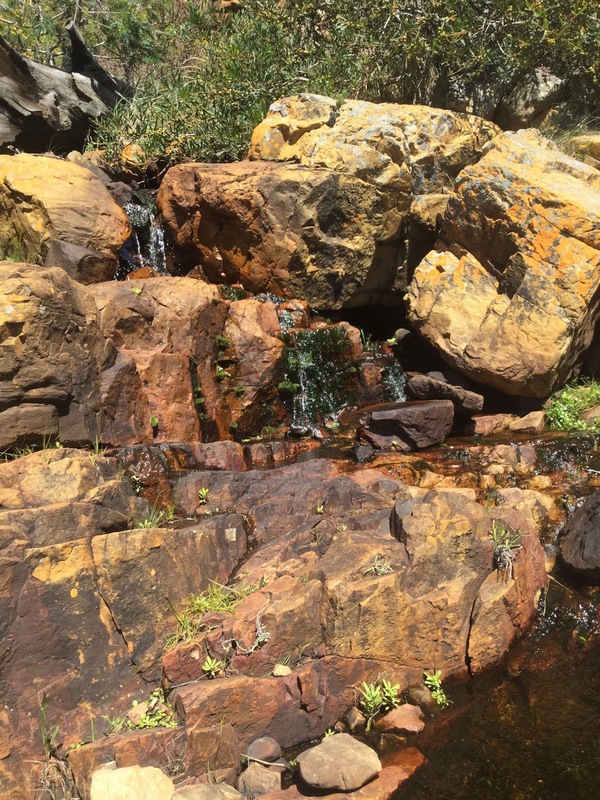 Including this walk up to Admiral's waterfall (all the details on getting there are on the awesome se7en blog. 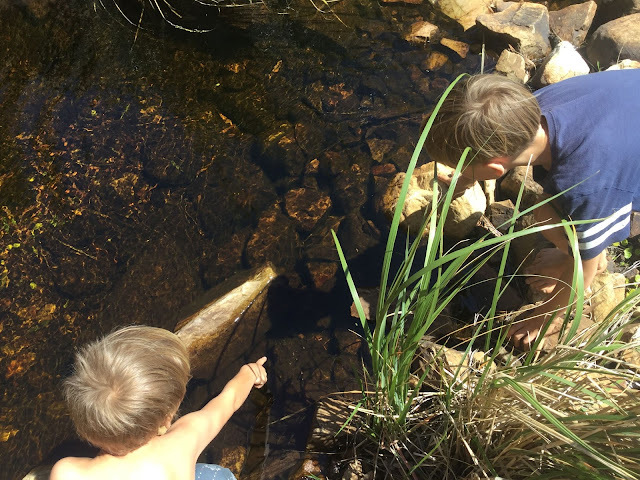 On this walk, we were finally able to find tadpoles doing well. I should have taken the Ergo but made the mistake of thinking Hana would walk. Also, I desperately need shoes, but seem to be making the transition to being barefoot, from sheer indecision over what shoes strike the right balance between different priorities (waste, comfort, fairly made, durability, cost, ability to protect your feet from snake venom...) So I'd recommend having an ergo for your toddler, and shoes for yourself. And chocolate. Wait, I'm still writing? Sorry. Here are some pictures. Check out this walk. Drive as far up the mountain as possible before beginning.